HONG KONG, April 5, 2017 /PRNewswire/ -- Private capital professionals, who historically have experienced a consistent rise in compensation, may be at a turning point. 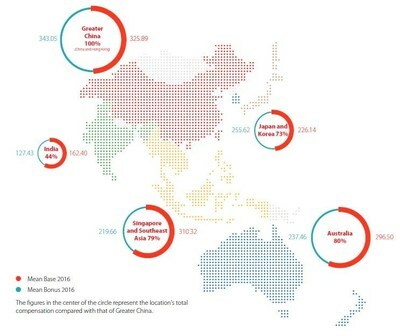 In the fourth annual edition of the Asia Pacific Private Capital Compensation Survey from Heidrick & Struggles, the trend of rising compensation for private capital professionals in Asia Pacific slowed in 2016, with the number of investors reporting increases in their base salary and anticipated increases in their bonus dipping compared to previous surveys. Almost two-thirds of respondents stated that there was no change to their base salary in 2016 and only 38% anticipated that their 2016 bonus would increase over the prior year. In last year's survey, nearly half of respondents said they received an increase in base salary and 45% anticipated a higher 2015 bonus. Review the complete survey findings at http://www.heidrick.com/Knowledge-Center/Publication/Private-capital-compensation-trends-in-Asia-Pacific-2017. "It was a challenging year in 2016 for private markets investing in Asia Pacific, and that's going to affect compensation growth," said Michael Di Cicco, Partner, Head of APAC Private Equity & Real Estate at Heidrick & Struggles. "Asking prices are high and competition is tough. Investments and exits were down both in terms of the number of deals and the overall value." Investments for the region were US$120.4 billion in 2016, down from US$142.9 billion in 2015, according to Asian Venture Capital Journal (AVAC). While investments continue to be considered strong, a small number of mega investments accounted for nearly 30% of the 2016 total. Compared with other Asia Pacific regions, China reported the highest compensation including anticipated bonuses due to the aggressive competition for top professionals and premium on investment in talent. Private capital professionals located in China and Hong Kong received the highest total compensation across the region, with a mean salary base of US$325,890 and mean bonus of US$343,050, while professionals located in India received only 44% of their China-based counterparts' compensation. "China continues to experience a short supply of seasoned investment professionals who can strike the balance of meeting Western compliance standards and cultural needs, and remaining 'local' enough to credibly execute deals on the Mainland," Di Cicco added. Conducted in November and December 2016, the survey features self-reported compensation trend data from 210 professionals across the Asia Pacific region working with local and global platforms. This year's survey includes compensation data from 2016, 2015, and 2014 as well as expected compensation development in 2017. The report evaluates trends in compensation packages, including base salary, bonus, and carried interest plans. Additionally, increased demand for venture capital investment professionals, particularly in Southeast Asia and Greater China, has led to an additional category for venture capital funds for the first time in this year's survey.